What are some of the most versatile merchandising fixtures for your business? Wire display racks not only provide ample storage solutions, but they also feature flexible placement options for more targeted marketing. 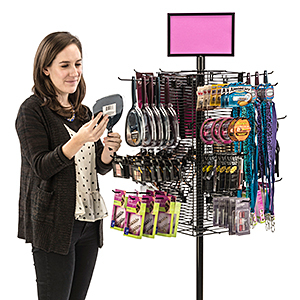 Manufactured from steel tube and wire in a dizzying array of available styles, these affordable instore displays come in tall floor-standing designs as well as smaller models for placement on checkout counters or showcases. Our wire display racks provide the means of getting your merchandise in front of customers. Whether located out on the sales floor or nestled next to the cash register, these point-of-purchase store fixtures are necessities for retail businesses of all sizes. Most wire racks are stocked for same day shipment in black, white, or silver finishes, so browse our sizeable inventory and get it fast - when you need it fast! What types of wire display racks are available from Displays2go? Literature stands that hold all kinds of periodicals do an excellent job of offering items for sale or organizing the waiting room. Floor stands, with multiple-level shelving or adjustable tiered pockets, showcase lots of magazines and/or folded brochures for easy recognition. Unlike wooden racks with pockets, the wire-frame construction aids visibility from all directions. Countertop styles are simply smaller versions of the floor varieties, and feature single as well as multi-pocket designs. Use tabletop fixtures for offering takeaway literature or for keeping service centers and doctor offices free of clutter. Rotating styles also come in both floor and countertop versions. Merchandising displays are the go-to fixtures for many retailers. Thanks to their low cost and high durability, these commercial wire racks offer lots of designs to accommodate virtually any type of product. Rotating spinner stands, featuring up to 72 wire pockets, are excellent choices for offering postcards or greeting cards. On the other hand, bulk bins store and display merchandise that's difficult to put on shelves, such as stuffed animals, pillows, and beach balls. Racks with adjustable slant shelving accommodate bottles, bakery items, and much more. Most models come with rolling casters with makes moving the racks to and fro very easy. Countertop styles are ideal for holding smalls, including blister packs, keychains, souvenirs, and other trinkets normally associated with the "impulse buy". Located at or near point-of-purchase checkout stands, these enticing store fixtures often provide a considerable amount of revenue for the retailer. Many of these models are also rotating, and are great for postcards. Gridwall fixtures are, along with industry standard slatwall, common retail store displays. They share the same designs as slatwall, but feature lower prices with much less weight. Available in black or white, our gridwall system offers floor placement or wall mounting options. Once you have chosen your fixture, shop from the many add-ons, hanging hooks, and baskets to fully customize your floor's layout and to take advantage of gridwall's ability to highlight LOTS of merchandise. Art display panels are gridwall's cousins. Featuring a similar wire frame construction, these panels are much lighter and are the best choice for outdoor art festivals, trade shows, and galleries. Hang canvases, mirrors, or other artwork quickly and efficiently. The modular design allows for custom layouts, easily accomplished with simple cotter pins that lock panels together. Both affordable and portable, this art display system is compatible with our gridwall hanging accessories, available for sale separately. With so many options to choose from, our metal rack inventory offers the most variety within a single web page. We are confident you will find exactly what you are looking for. Have a question or need help with an order? Our contact center is manned by knowledgable staff ready to connect with you via phone, email, or chat.